POn the last day in Torino Karen and I decided to experience the Museo Nazionale del Cinema one of the most important cinema museums in the world for the wealth of its collection. 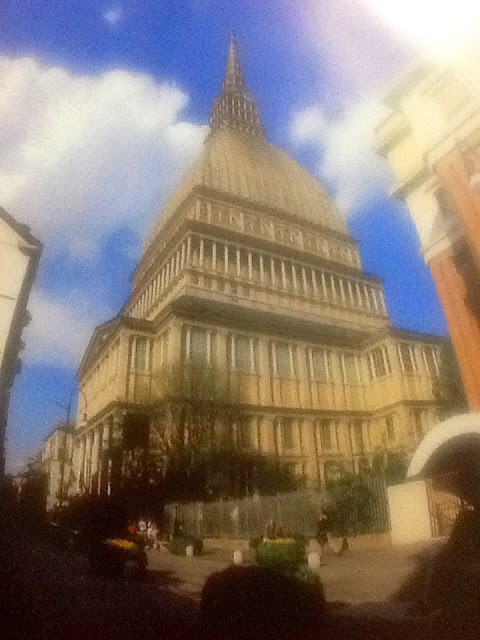 It is housed inside the Mole Antonelliana, symbol of the city of Torino. 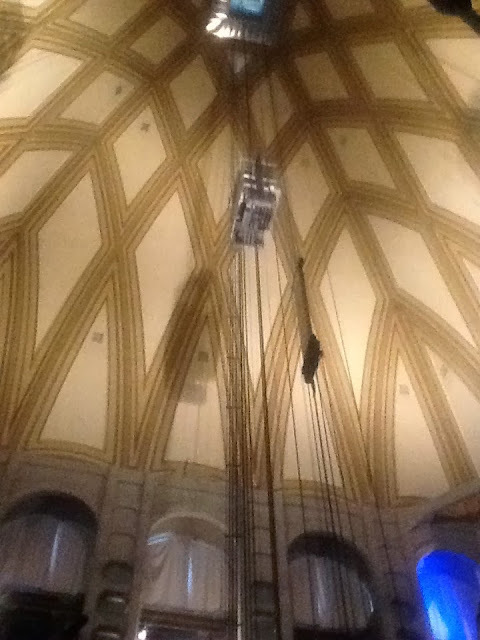 Part of the building experience was to ride the Panoramic Lift, vertically crossing through the Museum. The continuous and unexpected visual and acoustic stimuli create a spectacular presentation, revealing the secrets hidden behind the the movie and the steps preceding the screening of the film. 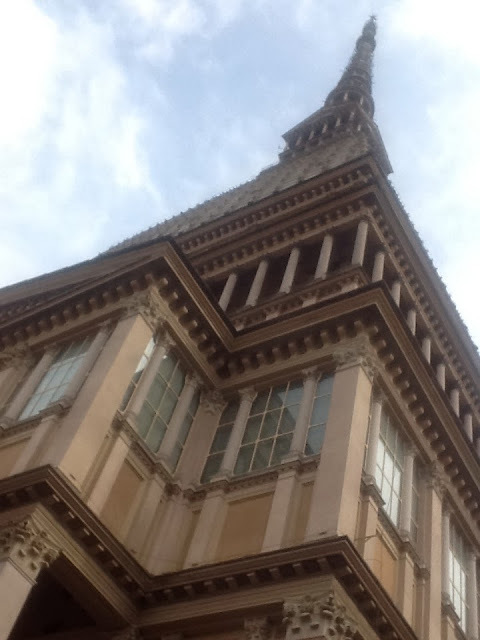 On our last night in Torino Dave and Beck wanted to take us to a Bar in the Piazza Victorio Veneto called La Drogheria. The Jamaican Italian making the mixed drinks entertained the huge crowd. Aperitivo was the approach for a meal. Buy a drink and eat what you like from a table of food from 6:00 to about 8:30pm. It's the sensible and cheap "happy hour". On our way home, a walk of about two kilometres, we met Mauro, Giorgio's son and Valentine's husband. This was a great surprise, because we would not have seen him this trip. 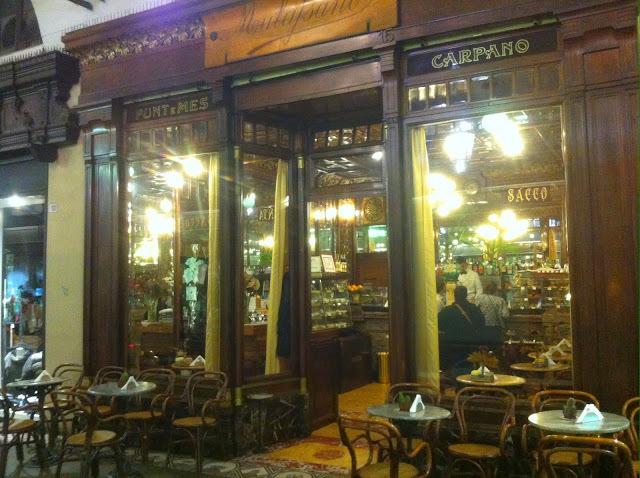 He did give us directions to one of the oldest and famous coffee shops in Torino, the Mulafsano. Used in films and for fashion photo shots.